My children are excited to be finishing up our home school year and will be completing 3rd grade, 1st grade and kindergarten. Over the summer break, I believe that it is very important to keep my children learning but we like to put a fun twist on traditional book work. In my opinion, continued learning is a great way to be ready for them to start their new school year prepared and with less frustration because they forgot everything over the summer months. Lakeshore Learning has come up with a brilliant way engage my children with a fun approach to learning that is exciting and has high educational value. Are You Ready? Game Shows are a comprehensive way to determine if the child will be ready for the upcoming school year. Featuring grade levels from kindergarten through the 5th grade, Are You Ready? Game Show is an exceptional learning grade that focuses on important language and math skills necessary for school success. 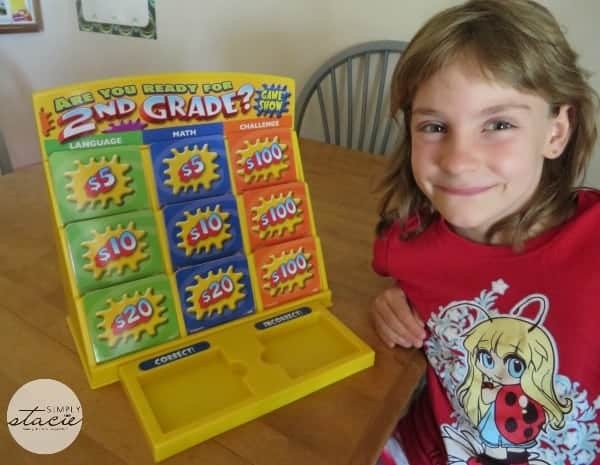 Each game includes a durable game stand with a discard tray for “correct” and “incorrect” answers, 240 playing cards, play money, reward coupons, score trackers and higher levels such as 4th grade include a passage booklet. With each grade level it is like you are getting six games in one because you and your child will answer a series of questions for each game which you can then track on the score trackers. Once all of the six games are completed then the results can be tallied and entered online so it will display the results. It will then give a free online assessment instantly which can help to determine areas that need extra attention. We recently had the opportunity to play two of these award-winning games including Are You Ready for 4th Grade? and Are You Ready for 2nd Grade? Game shows together. I was extremely pleased with the educational content and entertainment value of these two games and it was an even bigger hit with my children who loved the game show theme. In the Are You Ready for 4th Grade? Game Show, my son was the contestant and I was the game show host. 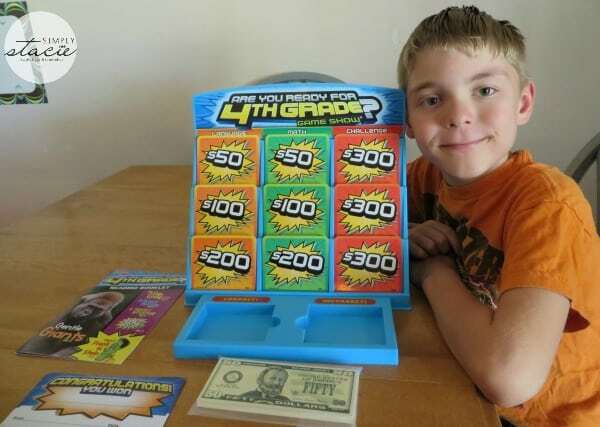 He would select a question from the game stand choosing from categories including language, math and “challenge” questions each one with a specific monetary denomination. If he answers the question correctly, he receives that amount in play money. I then mark whether or not the question was answered correctly or incorrectly on the score tracker and that question is placed in the discard area. After completing one game, he adds his money together and can earn a reward coupon towards a reward or prize of my choice. There are five additional games to play and I will then be able to get feedback via the instant online assessment. I really appreciate that Lakeshore Learning has clear, easy to follow play instructions and that the game play itself is flexible so the parent can choose how and when to play. For example, I have chosen to give Adam an incentive each time we play so that if he earns a combined monetary value he can choose a small prize from a “Star Student’ box that I always have on hand with fun trinkets. If he answers questions incorrectly, I explain to him how to answer it correctly and put those questions back into the mix of new questions for the next game. My plan is to play this game as often as the children would like but at a minimum of once every other week throughout the summer break. I really like the questions which are challenging but not overly frustrating for the child to solve. In fact, Adam was beaming with pride when he got an answer correctly but became determined if he did not understand a problem, wanting to figure out how to solve it. Once he has completed all six of the games and I complete the online assessment process, Lakeshore Learning will provide us with FREE printable activities and even give me additional product recommendations to consider which will address any areas that need extra attention. Are You Ready for 2nd Grade was equally popular with my six and seven year old children. My kindergartner begged me to allow him to play too and with a few minor adaptions to the game he did great just like his older sister! They particularly enjoyed the wide range of questions which are presented in an interactive, engaging format. I appreciated being able to watch them both use their problem solving abilities in order to answer questions presented in a way that perhaps they were not yet familiar. As a parent, especially one who has taken on the responsibility to homeschool my children, I often have wondered if I was doing enough and whether or not my children would be ready for the next grade level. With resources such as the Are You Ready For? Game Show from Lakeshore Learning, I no longer have to wonder and can simple play this game with my children to find out how we are doing! You are invited to visit Lakeshore Learning to purchase the Are You Ready For? Game Show that is the correct grade level for your child and browse all of the additional resources that are available for learning year round. Simply Stacie readers can save $10 off on any Are You Ready For? 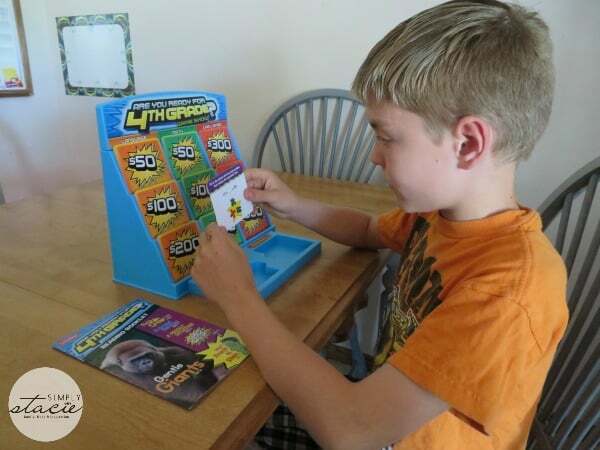 Game Show at Lakeshore Learning by using this $10 off special coupon link! That makes it only $19.99 which is an extraordinary value for this excellent educational game that is exciting and entertaining too. You can also connect with Lakeshore Learning on Facebook, Pinterest and Twitter. oh this looks like a ton of fun. I’m always looking for different things for my daughter, thank you. sounds like a great game! I will pass the info on to my nieces, who both have younger kids at home. These are so awesome, I need to get these for the kids. Awesome and fun way to learn!! Wow! What a fun game and great idea to keep kids learning while bonding and having fun over the summer. I really enjoy your posts….my grandkids are going to be in kindergarten and third grade. They will both be home schooled this coming school year, and they are continuing studies throughout the summer, too. Fun experiments and lessons. These are wonderful games that teach and lets them see their progress. Your kids are so adorable! The game sounds wonderful! Such a wonderful way to learn! Lovely!! This is a fabulous learning tool to help a child keep up and learn when not in school. Plus it looks like a lot of fun. When learning is boring than kids do not like it. I would love to have my nephew and niece have this wonderful learning tool. I think kids learn better when it’s a game. This looks like a great way to see how they’re doing. My girls would have a lot of fun with game! Thanks for sharing! This game looks like a fun way to keep kids learning through the summer. This game show sounds very educational! We <3 Lakeshore Products too! I think my daughter would enjoy these as well. When I was little we played real game show board games like Price is Right and LOVED them. The concept of using a game show for a learning game is nice – I’d love to play with my niece. Hi! This is such a great idea!! My grandson isn’t old enough for it yet but I’m going to let my daughter in-law know about the company. I’m glad your children enjoyed it. Too cute that your littlest wanted in on the older kids game. lol Thank-you for the information & review!